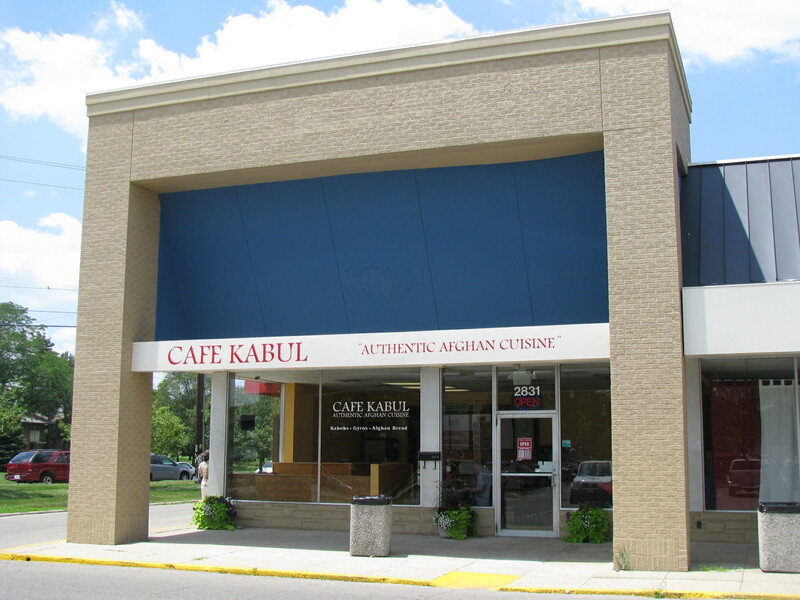 Located in a light, bright space at the southern end of the strip known as ‘University City Center’, Cafe Kabul is, to the best of our knowledge, the first and only Afghan restaurant in Columbus. Open only for a few weeks as of this writing, at lunchtime it was already drawing a decent number of students and office workers from the surrounding area. It is a casual, order-at-the-counter setup, and customers are given a number to be called when their food is ready. 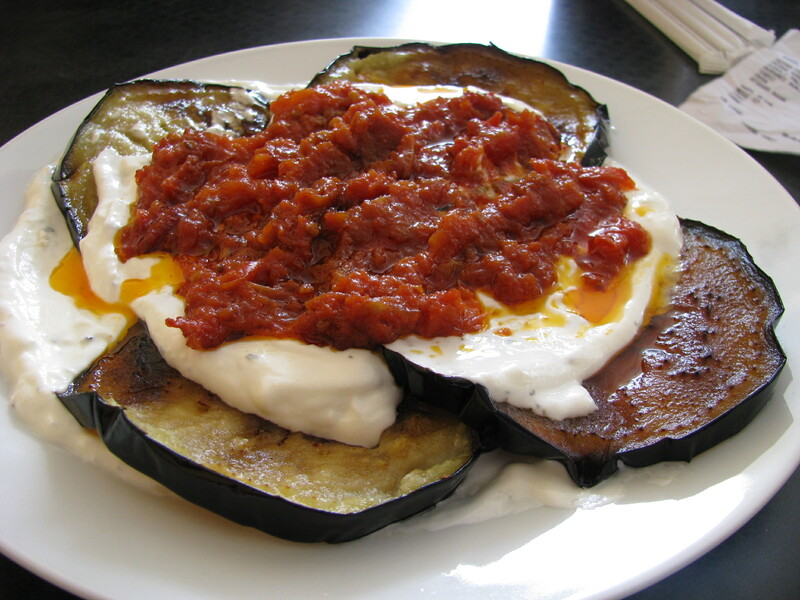 We started with one of the side dishes – buranee bonjon – a bed of sauteed slices of eggplant topped with homemade yogurt, tomato sauce and served with Afghan bread. The yogurt (which can also be ordered separately) was very tangy and the tomato added a little, but not too much sweetness. Pile a bit of each on some bread, and you’ll have a taste of what made this one of our group’s favorite dishes. 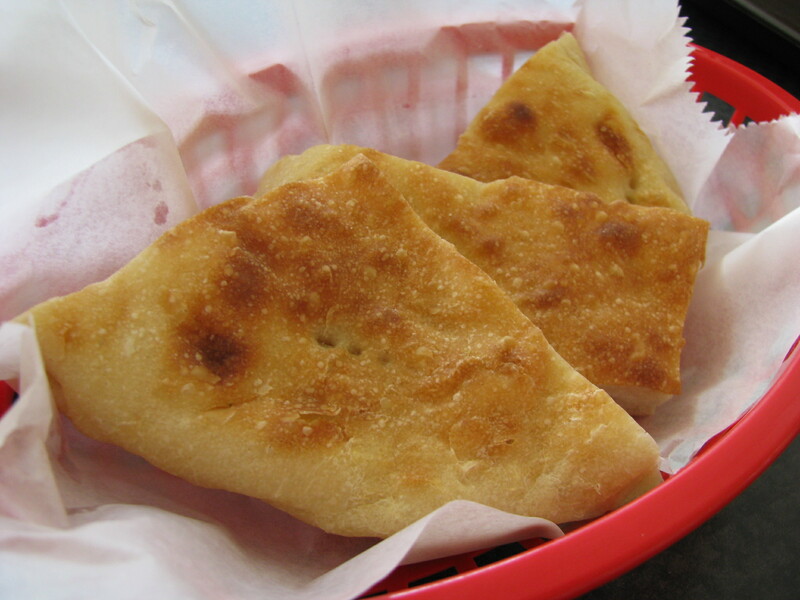 The bread, which I think was obi non, is thicker than pita bread and useful for scooping up yogurt and hummus. We also tried two of the other vegetable side dishes – sabsi (pureed spinach cooked with onions and garlic) and the sauteed okra with tomatoes and onions. Both were simple dishes that were (surprisingly) mildly seasoned, seemingly with the intent of letting the fresh flavors of the vegetables shine through. It works, in an ‘if you like spinach, you’ll like sabsi‘ manner of thinking. 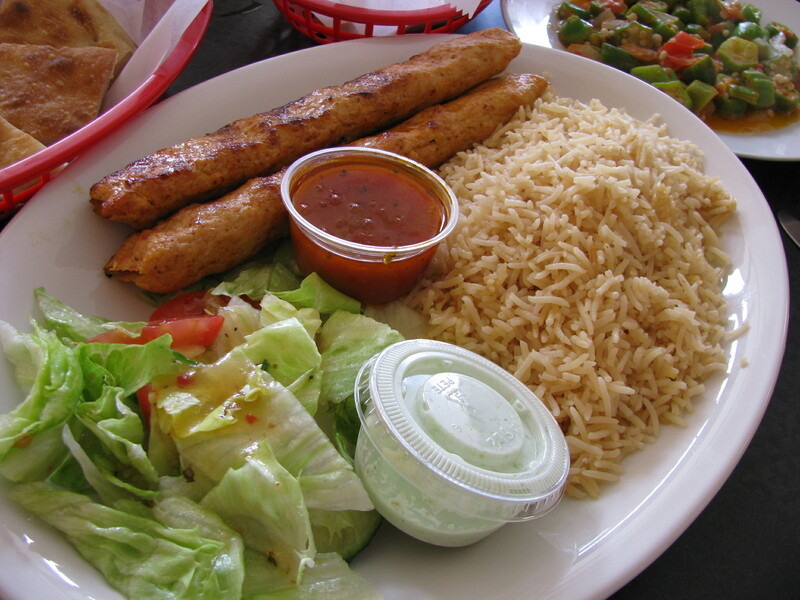 The majority of the mains are dishes are familiar from Middle Eastern or Indian cuisines: seekh kebab, tandoor chicken, chicken kabob and tikka kabob. We ordered one chicken seekh kebab – spiced ground chicken formed around a skewer and grilled – with the idea of comparing it to other seekh kebabs found around town. While it seemed a reasonable effort, others in town do it better. The more interesting mains were kabuli pallow and peshawari chaplee kabob. 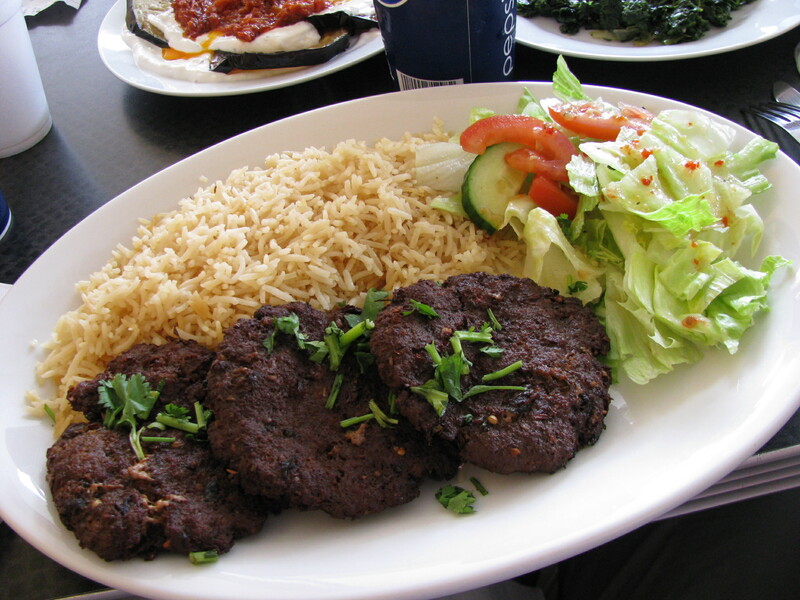 The peshawari chaplee kabob (more commonly chapli) consisted of three meat patties made of ground beef mixed with freshly ground spices and grilled to well-done. The intriguingly complex flavors of this dish were roundly appreciated, though the meat was a bit on the dry side for our tastes. As with most of the main dishes, it can be served either with rice and salad or with bread and salad. The included mint chutney was a worthy accompaniment. 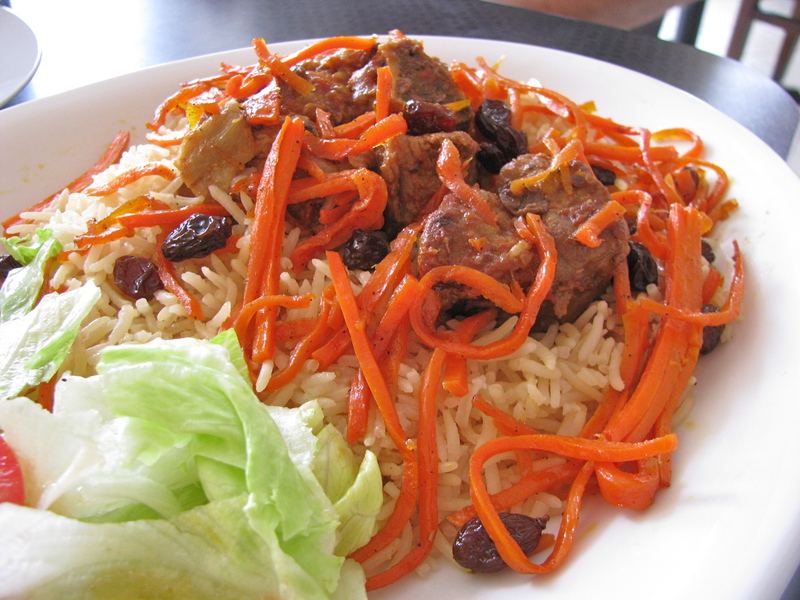 The kabuli pallow (palao) is a variation on one of Afghanistan’s national dishes – Afghan style rice topped with chunks of lamb, spiced sauteed carrot strips and raisins. This dish was popular – their lamb was a thing of beauty – but at $9.49, it struck us as though there wasn’t very much of it. Although there are no vegetarian main dishes on the menu, vegetarians could find enough to eat from a selection of the sides and appetizers. Service was leisurely but acceptable. Having done some research on Afghan cuisine, it seems that Cafe Kabul is merely scratching the surface of the range of dishes. It’s a great addition to the University City Center but may not worth a drive across town. I hope that Cafe Kabul will offer more variety as they get established and that we will see more Afghan restaurants opening in Columbus.